By not giving ourselves the minutes — or hours — free of devices and distractions, we risk losing our ability to know who we are and what’s important to us, says physicist and writer Alan Lightman. In 2016, the Harvard biologist emeritus and naturalist E.O. Wilson (TED Talk: Advice to a young scientist) published Half-Earth: Our Planet’s Fight for Life, in which he proposes that half the earth’s surface be designated and protected as conservation land. Just since 1970, human beings have destroyed more than 30 percent of forests and the marine ecosystem, according to the World Wide Fund for Nature. The destruction has been an unintended consequence of population growth, the desire for increased material wealth and comfort, and the associated need for more energy. It’s also been driven by the inexorable imperative of capitalism and the powerful desire of certain individuals to increase their personal wealth. Wilson’s proposal might be difficult to achieve, but it represents a recognition of the importance of our natural environment and the forces that threaten it. The destruction of our inner selves via the wired world is an even more recent, and more subtle, phenomenon. The loss of slowness, of time for reflection and contemplation, of privacy and solitude, of silence, of the ability to sit quietly in a chair for fifteen minutes without external stimulation — all have happened quickly and almost invisibly. A hundred and fifty years ago, the telephone didn’t exist. Fifty years ago, the Internet didn’t exist. Twenty-five years ago, Google didn’t exist. Wilson’s proposal is bold, and I would like to make a similarly bold proposal: that half our waking minds be designated and saved for quiet reflection. Otherwise, we are destroying our inner selves and our creative capacities. Different moments throughout the day can be devoted to contemplation and stillness, free from the external world. How do we cultivate a contemplative habit of mind? Twenty years ago, a friend who taught high school in Arlington, Massachusetts, started something new with her students. At the beginning of each class, she rang a bell and asked them to remain silent for four minutes. As she wrote later, “I explained [to my students] that I felt our school days were too fast-paced and filled with noise, that silence could help us leave behind the previous class, and prepare to be present for this one. That it was a time to clear our heads. I said we were aiming for internal and external stillness.” The results were miraculous, she told me. Both she and the students were calmer and more centered. In recent years, numerous organizations — such as Mindful Schools and Mindful Education — have been created to introduce periods of quiet and meditation into primary and secondary schools. For example, in 2015, mind-body educator Stacy Sims started a program called Mindful Music Moments in which students listen to four minutes of classical music during the morning announcement period — similar to the idea of my friend in Massachusetts. Mindful Music Moments now operates in 65 K-12 schools, camps, and social service organizations, most of them in Cincinnati. • For K-12 students, a ten-minute period of silence sometime during the school day. Students could quietly write down thoughts in a notebook during this time. Different schools have different cultures, and each school will know how best to institute this period of silence. • For college students, “introspective intensive” courses created by each academic department. Each student would be required to take at least one such course each semester. Introspective courses, while based in the particular subject matter of the department — for example, history or chemistry — would have a reduced load of reading and assignments and encourage students to use the free time to reflect on what they are learning and relate it to their lives and life goals. • In the workplace, a quiet room or similar space where employees are permitted and encouraged to spend a half hour each day meditating, reflecting, or simply being silent. Smartphones and computers would not be allowed in the quiet room. This period of quiet would not be part of the regular lunch break. • For families, an unplugged hour during the evening, perhaps during dinner, in which all phones, smartphones, computers, and other devices are turned off. Dinner should be a time for quiet conversation. • Individuals should think about how they spend their time each day and try to build in a half hour away from the wired world, such as taking a walk while unplugged, reading, or simply sitting quietly. • For society as a whole, mandated screen-free zones in public spaces, where digital devices are forbidden, and labor laws in which workers are guaranteed a half hour each day of quiet time at the workplace. Don’t we owe all of our children a world in which their contemplative lives are valued and supported? Don’t we owe it to ourselves? I believe that we can develop a new habit of mind toward the wired world, but it will take time. We will first need to recognize the danger. Certainly, younger people should take some responsibility for their addiction to the wired world at the expense of their inner selves. But shouldn’t we who created that world take more responsibility? We are victims ourselves, but we are also the perpetrators. Don’t we owe all of our children a world in which their contemplative lives are valued and supported? Don’t we owe it to ourselves? Excerpted from the new book In Praise of Wasting Time by Alan Lightman. Reprinted with permission from TED Books/Simon & Schuster. © 2018 Alan Lightman. Alan Lightman is a physicist, novelist and essayist. He was educated at Princeton University and at the California Institute of Technology, where he received a PhD in theoretical physics. He is the author of six novels, including the international bestseller Einstein’s Dreams, three collections of essays, a book-­length narrative poem, a memoir and several books on science. His writing has appeared in The Atlantic, Granta, The New Yorker and The New York Review of Books, among other publications. 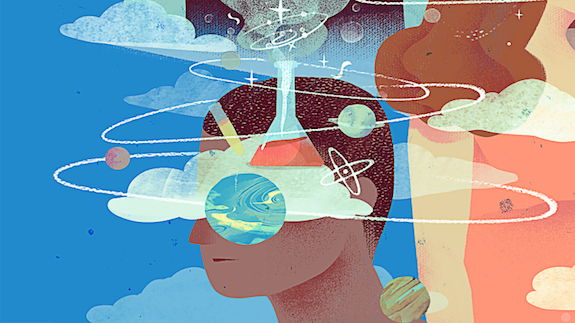 This piece was adapted for TED-Ed from this Ideas article. IT’S TIME: Connect Week is Here!